The situation is as follows: I like salmon. I like pasta. I felt certain when I spotted Salmon Pasta that the two elements would find a marriage of great harmony, not unlike the peanut butter and chocolate nuptials that brought us so many decades of low-rent pleasure. What I particularly like about this recipe, outside of its many-food-groups-in-a-bowl goodness, is that while it has three steps taking place in three separate pans, they are done more or less simultaneously, thus somehow lessening the time and work load of the entire process. The first step takes all of three minutes: salt, pepper and lightly oil your (I hope extremely fresh wild) salmon and toss it on a lined baking sheet as requested by mariaraynal, and pop it in your pre-warmed oven. I would like to pause here briefly to tell you all about a very exciting thing that has occurred in my life –- I went to Surfas, the restaurant supply store in Culver City, on Sunday and purchased a huge flat of pre-cut parchment paper. The first piece was used for my salmon. Oh, joy! Okay so while your salmon is cooking (you won’t let it overcook right? Thank you.) go ahead and get the water boiling, then add the sturdy pasta that was requested of you. She likes penne. So do I.
I talked to my husband on the phone for the entirety of the next step, which is chopping up a cup of shallots. Don’t skimp. In fact, if anything, I would like to see two cups of shallots for this recipe, which calls for a pound of pasta (even though I did not throw the entire pound into my final dish). The shallots are the love of this marriage –- the pasta and the salmon being perhaps its commitment and virtue, respectively –- and you really want to taste them in this dish. Ditto for the pepper flakes. Be generous of hand. Use the best anchovies you can get your hands on, as I have lectured before. Mariaraynal asks you to reserve your entire pot of pasta water in the event you need to moisten the pasta shallot mess you will soon have in your large frying pan. I think this is excessive; I used a tablespoon. So just save a cup, ok? The incipient vegetarian –- at present a pescatarian, she says -– came home from the gym and rested a bowl precariously on her knees. She never had to be told to keep eating. “I never really thought about salmon and pasta mixed,” she said, a fan of both. Now we all know better. 1. Put a pot of water over high heat on the stovetop for pasta. When the water come to boil, add a handful of salt and cook the pasta for about 8 minutes, or until al dente. Drain and save pasta water. 2. Meanwhile, preheat the oven to 400 degrees. 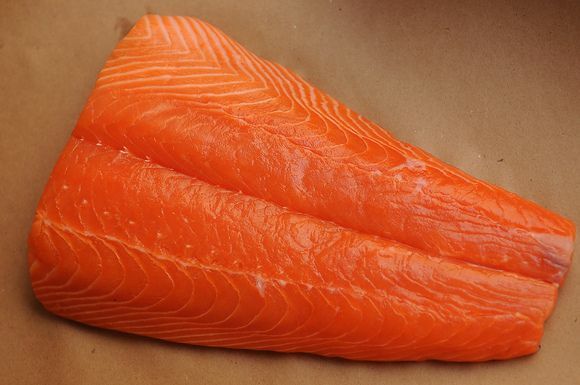 Place the salmon fillet on a lined baking tray and season well with sea salt and freshly cracked black pepper. Drizzle lightly with olive oil. Bake for approximately 25 minutes, or until the salmon flakes easily with fork. 3. In a large skillet, heat the olive oil over medium heat and add the shallots, stirring occasionally, until translucent. Add the garlic and anchovies and continue to stir. Season with black pepper, crushed red pepper, and, if desired, salt. 4. When the shallots and garlic are soft and lightly caramelized, add the drained, cooked pasta to the skillet and toss with the shallot mixture until well combined. Deglaze with the wine and reduce for several minutes. 5. Remove the salmon from oven and flake into large pieces. Place in the skillet and stir gently. If needed, add some pasta water and check the seasoning. Zest the lemon over the pasta and serve. This is wonderful! I cooked salmon in the oven and then we ended up going out to dinner, so I had good salmon to mix in the next day. I also used a flat pasta infused with garlic and spinach, which made this dish even more colorful. Since I didn't have anchovies, I put in some Worcestershire sauce, which has anchovies as a main ingredient. Finally, my instinct is to put cheese on pasta, sorry. So I added a little grated mozzarella at the end and let it melt slightly. Very delicious. Smells good, too! This is a stupendous recipe! I grilled my wild Coho fillets until the skin was a bit charred and crispy, which gave them a lovely, faintly smoky flavor (and didn't heat up the kitchen!). I also added a squeeze of fresh lemon juice and some chopped parsley at the very end. they are really practical, time saving and they aren't all curled up like the parchment on a roll. Ultimately, I think you use less. That's my story, anyway, and I am glad to to see others agree! So, last Monday we were on vacation -- I took a quick peek at Twitter and saw food52's Tweet about pasta and salmon. I never do this, but I RT'd it without linking to the piece, because, hey, it's Amanda/Merrill/Jenny, so I know it's all good. So we go about our day: boating, walking, eating, drinking, the whole thing. Great fun. But come 3:30 a.m., I'm wide awake, so I amble out and check my BlackBerry (I know, I know). Suddenly, I realize, this is my recipe! Jenny made my recipe and wrote about it! And it's the middle of the night and the whole world is sleeping but me! I wonder if anyone could hear me giggling? At any rate, thank you, Jenny, and I'm glad the Tween liked it! I love Surfas! I use to live in LA and still plan trips back to browse and buy. Can't wait to return. you could do that but this method really is fast! mrslarkin, thanks to the parchment, you barely need to wash the cookie sheet. Very quick/easy. You could also use leftover salmon to save time (and keep your kitchen cool), and break it up into large chunks shortly before serving. You could even use leftover pasta (just cook it VERY al dente) and saute it in the mixture until warm. I have made several of mariaraynals recipes and they never disappoint - she rocks! Good choice! Plus getting the thumbs up from the Tween is huge, right?